Every bottle of 0.05 liters can be found from the types of gin Hendrick's and Bombay Sapphire. The tonic of Fever Tree is delivered in this package in the flavors Indian tonic and Lemon tonic. Together with liquorice and lime you can make a Hendrick's gin and a Bombay Sapphire gin tonic, two perfect gin tonic cocktails. Hendrick's gin is made from the traditional juniper, along with Bulgarian rose and cucumber. This gin is delivered in a stately apothecary bottle in dark brown. A tough gin, which together with Bombay Sapphire forms an original gift. Bombay Sapphire is Hendrick's counterpart in appearance with its sapphire blue bottle. For the distillation of Bombay Sapphire use is made of ten spices, which have been specially selected for this gin. Together with juniper, these herbs from Bombay Sapphire make a complex gin with a subtle taste. 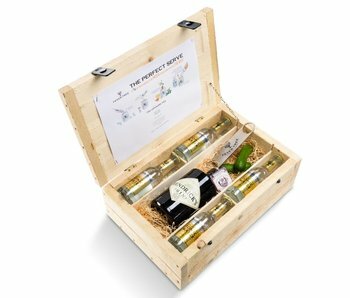 Thanks to the luxury wooden packaging, the packages from gintonicbox.nl are original gifts. 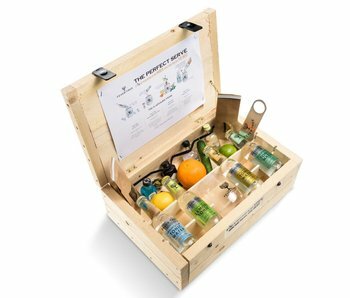 With two types of gin, this package is also a gift with a story. Whether you buy this package as a fun birthday present or as a luxury promotional gift, you will have a good look at it. The warrior will be positively surprised.